It was an eventful year for TOC in 2009. Ravi Philemon. 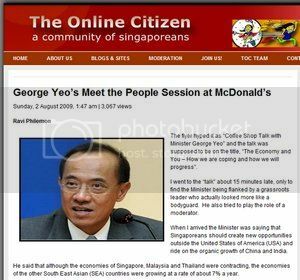 At the close of the year 2008, one of The Online Citizen’s (TOC) writers, Benjamin Seah said that 2008 was the year of the blogger-activist. If 2008, was the year of the blogger-activist, 2009 was surely the year of the activist-blogger. TOC took on the role of an activist by putting out editorial positions and speaking out in 2009, for foreign workers through the Foreign Workers Focus Week; for the bridging of the divide between the government and blogosphere; against the Marxist Conspiracy and the continued relevance of the ISA; against the Film’s Act; for Siew Kum Hong – for him to be kept in parliament; against the Public Order Bill and the restrictions it places on the constitutional right of the citizen for expression and assembly; for the government to adopt greener land transport alternative; for Temasek to be more transparent on its investments and losses; and against the media silence on Vui Kong – describing it as a national shame. We covered the recently concluded COP15 or the United Nations Climate Change Conference and our representative, Donaldson Tan, flew to Thailand to cover the ASEAN People’s Forum and the ASEAN Summit. In Thailand, he was nominated to represent the economic interest of the youth sector in ASEAN. And who can forget our live coverage of the AWARE saga – our servers crashed a few times that day. We were the first to report many breaking news including the installation of CCTVs in Hong Lim Park. An Indonesian acquaintance who came to know that I was a writer for TOC, told me that he read TOC to know what really happened with David Widjaja – he said that he did not trust the mainstream media’s report on the incident. We critiqued the various parties’ National Day messages and got criticised by some for it. Our article, “Is Hokkien my Mother Tongue?’, [written by Alfian Sa’at] was widely read and re-printed in the Straits Times. We covered almost every alternative voice in Singapore – from exclusive interviews with NMPs like Viswa Sadasivan, to the 25 years in Parliament celebration of Chiam See Tong, from opposition walkabouts to interviews about youth in politics. We wrote fearlessly about the CPF, HDB, electricity price hikes, unemployment, discrimination of the disabled, plight of the homeless and so on. In 2009, a reader – Lionel De Souza – urged the Media Development Authority to take action against TOC for igniting the flames of religious disharmony. Then there was Janet Wee, who emailed the Singapore Police Force (with copies to the Attorney General Chambers, as well as Minister Mentor Lee Kuan Yew) asking them to investigate TOC, for carrying an article with “seditious remarks about Mr Lee”. Not forgetting our own internal drama – where Andrew resigned (temporarily) but came back, only this time as the Chief Editor; the leaving of writers like Benjamin Seah and Tan Kin Lian and editors like Gerald Giam and Deborah Choo. Zheng Xi, one of the founders of TOC, is our Editor-at-Large, giving of his time even as he pursues his studies in New York University. In 2010, we will have a new look – look out for it. We will have a focus week on discrimination in Singapore. We will also have a JBJ Special on his birthday on 5th January. Thank you for supporting TOC these last 3 years. 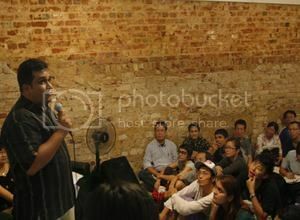 In 2010, we will try and become semi-professional and move closer towards advocacy journalism. We of course will have to count on your support in 2010 and in the years to come for TOC to continue to mature and to be a voice for the voiceless, and to truly be a community of Singaporeans.